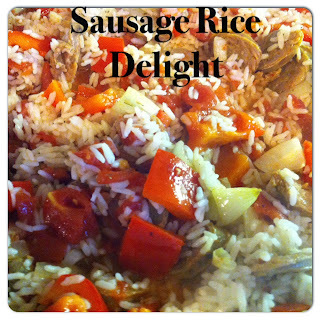 An easy to follow recipe using hot Italian sausage where everything can be prepared ahead of time and cooked 20 minutes before serving. This one skillet dish will serve 3-5 people. 6 Hot Italian sausages cooked and sliced. Ahead of time cook your sausage and rice. Set aside. If not making right away refrigerate the sausage. When you're ready to start cooking, in a large electric frying pan (or large stovetop skillet) heat your oil. To the oil add the onions and cook for a few minutes. Add the garlic and red pepper. Cook for about 2 minutes. Next add the sausage slices and continue to cook and stir. Spoon out the diced tomatoes using a bit of the juice and add to the skillet. Sprinkle with the Italian seasoning, ground pepper, and Slap Ya Mama. Add cooked rice and cook until everything is heated through. Yum. We eat sausage and rice a lot around here. I use the Butterball turkey sausage most of the time. I think I'd like to try this recipe. Peg I hope you enjoy the recipe as much as we did. This sounds like a fried rice with Italian sausages. I would like to try this next time I have bought Italian sausages. Thanks for the recipe. Thelma, You're welcome and enjoy! Looks and sounds really good! I would use milk sausage for my taste even though the rest of my family would rather have the hot. I'm sure it would be just as tasty with any type of sausage. Thanks for stopping by, so nice to see you.